We’ve spent quite a bit of time lately talking about the “essence of surfing.” What is the essence of surfing? Is there even such a measurable thing? The truth is that the essence of surfing is simply a concept, an ideal shared by the surfing collective but manifesting itself to each individual in myriad ways. Maybe it’s easier to see what the essence of surfing is not. But rather than go into such a possibly bleak discussion its probably best to look at one very keen example of this essence by way of a soon to be released film titled Musica Surfica. Written and directed by Mick Sowry, Musica Surfica is unlike any surf film you’ve ever seen before. The concept is the marriage of classical music and finless surfing into a new manifestation of art with roots as far back as anyone can trace. The film combines elements of ancient surfing and modern surfboard designs with ancient instruments and new approaches to playing classical music. Sounds strange? Perhaps, but the results are inspirational and certainly at the height of the art of surfing. A group of surfers, led by the stylish and talented Derek Hynd, go to King Island, Australia and spend a week riding a variety of finless surfboards. One of the members of the group is Richard Tognetti, artistic director for the Australian Chamber Orchestra and an accomplished surfer. Hynd and Tognetti came up with the idea of collaborating on a film project that would expand the boundaries of music and surfing. For Derek this meant introducing others to riding without fins, something he has learned to do quite well. 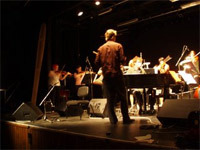 And for Tognetti the project allowed him to step out of the walls of the sometimes ultra-traditional classical music world to include other forms of music and less traditional venues. Derek Hynd says in the film that his “passion is investigating the unknown.” It’s evident in the way that Hynd slides and spins in and out the critical sections of the wave that he has seen the unknown and may be even coming out the other side. As for the music, just a look on the faces of the spectators is enough to make one smile, let alone the seeing the blinding speed and precision with which Tognetti plays his instrument. After watching the film several times I am left with an overall feeling of inspiration to continue along the path of dedicating my time to pursuing surf. This may indeed be the most striking aspect of Musica Surfica. Tognetti states that surfing is “about the celebration of the individual.” Removing the fins has forced surfers like Tom Carroll to re-evaluate his relationship to the ocean and rely strictly on his ability to become part of the energy moving across space. Without fins, the activity becomes all encompassing with all attention focused on the slide. The same happens with the performers and audience —a complete and undivided attention. And the surfing? In the beginning of the film the surfers are struggling to make the finless craft work but they quickly progress through the film. However, in the end, we are treated to a spectacle never seen at most of our local breaks. Derek Hynd, spinning madly in and out of barrels, crouched as if ready to spring, ready to burst with power, and yet keeping cool, collected and in complete control. And then as if we still weren’t sure about the whole fins free thing, we see footage of Hynd surfing J-Bay like he did in Litmus, except this time it’s finless and flawless. Musica Surfica is about finless surfing and live music. But it is also about our individual relationship to the act of surfing and how our passion is connected to the past. The film also dares us to be open to new possibilities and new challenges both in and out of the water, to be adventurous and courageous even if it means that we don’t hit the lip as we’d like. As for exploring the essence of surfing, there’s plenty to ponder in this beautiful film which I gaurantee you will watch over and over again. Thanks for the review. I can’t wait to see and hear the movie! the market will bear anything. between surfer, surfboard and wave. Word is we might watch it in one of the 2 surf film festivals happening very soon in Europe (April-May and June). Can’t wait!!! 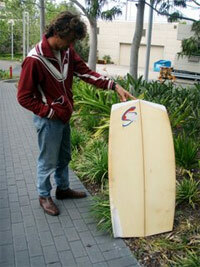 Classical music meets finless surfing? A well tasted pairing.